OLATHE — Curtis Keddy wasn’t eager to take part in a parish-wide participation program in Financial Peace University. But as director of faith formation at St. John Paul II Parish in Olathe, how could he refuse? “I was very skeptical,” said Keddy. “I would not have done it if I hadn’t been asked to do it as a staff member. Instead, Curtis and his wife Amy discovered that Financial Peace University, developed by Dave Ramsey, is a biblically based program that teaches people how to manage their money responsibly and faithfully. “We moved to Kansas just a year and a half ago,” he said. “We wanted to buy a house and were trying to figure out a plan to do that. This program was extremely beneficial in teaching us about mortgages and everything you need to know when buying a house. “Now, we really feel we’re building a firm foundation for our family’s future, which is great,” added Keddy. That’s half the reason why pastor Father Andrew Strobl promoted parish- wide participation in Financial Peace University this year. He wanted to help parishioners build firm financial foundations for their families. But the other half is that he also wanted to build a firm financial foundation for the “bigger” family of the parish. St. John Paul II, founded in 2016, meets in borrowed spaces and has a master plan for a church and school. At some point, parishioners will be asked for financial gifts to build the parish’s physical presence. The big question was this: Would people give? The research wasn’t promising. Which left the parish a lot of room to grow. People want to give, he believes. But research shows that uncertainty about finances and debt inhibit not only giving, but also participation. The malevolent poison of debt seeps into all other parts of people’s lives. So, what to do? There had to be something better than “putting the touch on” fundraising. The answer — Financial Peace University — was provided by parishioners Matt and Meili Brady. Matt Brady is chairman of the parish finance council. He and his wife attended Financial Peace University in 2000 and have since then taught the program at various churches, including their former parish of Prince of Peace in Olathe. “Knowing that we would be in a growth phase in terms of attracting parishioners, growing services for parishioners and eventually a physical church home, I started to talk to Father Andrew,” he said. He told Father Strobl about Financial Peace University, and the pastor thought it was a great idea. First, the parish selected a leadership team of about 25 people to go to St. Louis last spring to be trained by Dave Ramsey’s organization. This first group led 29 families in the nine-week course beginning in July. Next, from this first group, leaders were trained for the second, larger enrollment of 123 families that took the course from Sept. 15 to Nov. 12. The parish-wide approach is called “Momentum.” It offers many different times and days for people to meet in small groups for their Financial Peace University training. Momentum also offers a lower cost of $90 per person. The numbers aren’t in for the second group, but the summer “leadership” group was very successful. 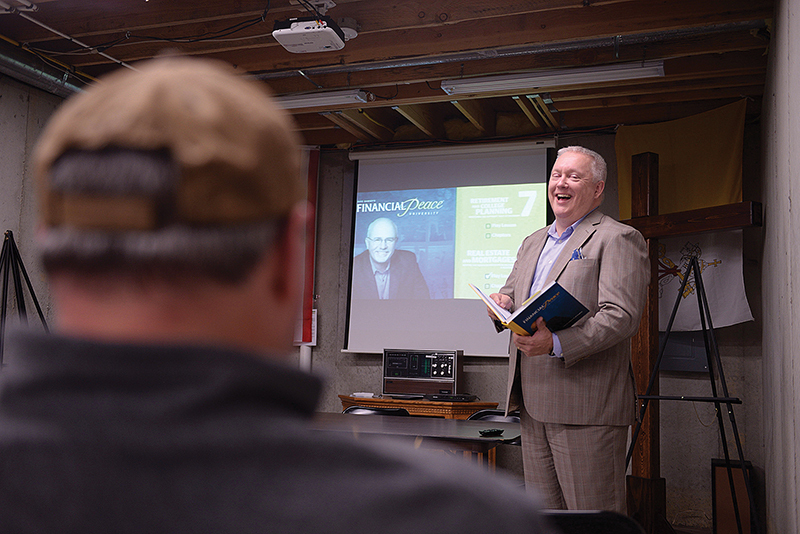 Financial Peace University has given several participants calmness, confidence and control about their finances that they never had before, said Matt Brady. They also see spiritual benefits.